Marketers are always looking for more efficient ways to reach audiences and meet business objectives. 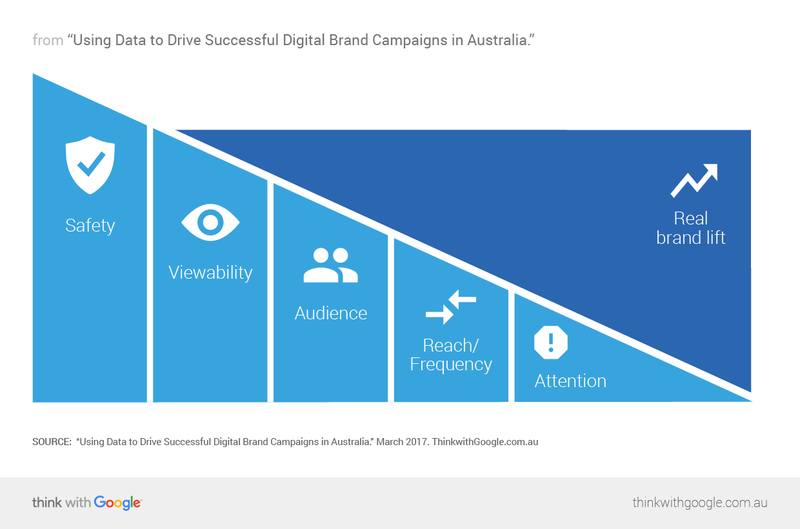 Here, Aisling Finch, Google's head of marketing in Australia and New Zealand, breaks down how Google's marketing team optimises its campaigns. As marketers, we're united by a common aim: capturing audience attention. We know that we need to go beyond spots and dots, impressions, and viewability and focus on actually capturing the attention of our audiences. Attention is the currency that matters if we want to achieve our objectives. Even though our business goals may vary across different campaigns, gaining attention always matters. Whether the goal is to change perceptions or drive action, as a starting point we need audience attention. Our media-buying approach is core to this, and we're not just talking about post-campaign research. Gone are the days when marketers spent dollars, crossed their fingers, and waited for research to come back and tell them whether their campaign worked. We're optimising throughout our campaigns, while live, to signals that have a causal relationship with brand lift. And we've found optimising in this way delivers up to 33% stronger campaign results compared to control groups. This requires both sophisticated technology and great creative. No matter how sophisticated the tech gets, it's still about connecting consumers to relevant messaging in the right moments. On the technology side, Google Marketing Platform1 gives us the ability to use advanced targeting, leverage first- and second-party data, compare apples with apples across digital properties, and optimise to signals that drive brand lift. Here, I'll share how we think through our brand campaigns. We can look to the framework below to understand how we think about building on foundational metrics, such as brand safety and viewability, with elements that have shown a causal link to higher performance: audience targeting, reach and frequency, and attention. We always want to ensure that ads show up in brand-safe environments—a no-brainer for any marketer. We use Google Marketing Platform Verification to ensure we're not showing ads alongside unsuitable content or sites we have identified as not-brand-safe. We maintain lists of sites and properties where we actively block our ads from showing as well as apply lists of contextual keywords for exclusion, and we update these regularly. Viewability standards continue to be a hot topic in the industry. We know that a high level of ad viewability is essential to driving success for brand campaigns, but that's just the starting point. We work with publishers on an ongoing basis to identify ad formats, placements, and environments that drive better viewability. In doing so, we drive better performance. Finding the right audience at the right time—and engaging with that audience at the right frequency—is vital for any campaign. And the power of first-party data really helps us deliver here: first-party data means we can leverage what we know about our existing customers' interactions with and usage of our products. Applying this to our media targeting helps us deliver more relevant information to our users. After testing first-, second-, and third-party data, we've found that first-party data performs best. Developing strong working relationships around second-party data is also delivering significant value. With third-party data, we are still testing and learning what works best for us. Delivering a high level of reach against your target audience is essential. But, it's also important to deliver frequency of viewable impressions so the consumer can understand the brand and product messages. On the flipside, we don't want to deliver too many ads, which can annoy consumers and waste money. Frequency shaping helps us strike the balance. Attention Attention, attention, attention—this is the variable we're most interested in to drive real brand lift. It's important to ask: Are you capturing your audience's attention? How are you measuring this? Your metric should be determined by your objective—learn more about identifying and optimising to your KPIs here. Using this framework helps us keep our campaign's foundation safe; optimising to attention helps us drive maximum effectiveness. Our recent Pixel campaign is a great example. With Display & Video 360, we looked at attention metrics in real time for both our display and our video ads. This led to a successful campaign, driving significant 15% uplift in awareness for the new device. In summary, we use data to refine our audience, understand what it wants, and decide how to incorporate these insights into the ad experience. The power of programmatic fuels all of Google's marketing campaigns, allowing us to serve the right ad in the right moment. And, most importantly, it allows us to deliver this experience at scale. Aisling Finch discusses a framework for optimising brand campaigns at the Google Marketing Platform Leadership Summit, November 2016.